The marriage of Stephen Hawking and Jane Wilde – as told through the ex-wife’s memoir – has become the stuff of a Hollywood tragic-romance. I have not read her memoir but have read excerpts and reviews of it. The Jane Wilde Hawking Jones book, Travelling to Infinity – My Life with Stephen, was written a few years after their divorce (the Hawkings had been together for nearly 30 years). The Theory of Everything, the Hollywood adaptation, is a very loose interpretation of her story of their time together. The film makes a compelling and fascinating account, but it is an extraordinarily unfaithful rendering. The screenplay adapters knew what they were doing in their rewrite – they were presenting a story that should fill theatre seats. It is intended as entertainment, of course. As entertainment, the movie works well. The viewer is quickly engaged in the awkward charm and cerebral wit of young Stephen Hawking (Eddie Redmayne) and the quiet poise and dignity of his wife Jane (Felicity Jones). The film begins with Hawking’s arrival at Cambridge, the first signs of his progressive motor neuron disease, his PhD defence, and his meeting of Jane. (They were introduced through Jane’s sister, but the movie has us believe that Hawking spied her at a party and pursued her through some quirky schemes.) The movie trails through Jane’s incredible efforts to build a semblance of a family life for their children while simultaneously dealing with her husband’s unimaginably challenging progressive paralysis, her own infidelity, and Hawking’s growing fame. The film shows their parting and a final reconciliation. Although they were married nearly 30 years and their children became adults, the ending scenes present the children as grammar-school kids, for obvious emotional effect. The movie does a good job documenting the progression of Hawking’s motor neuron disease, which has been described as a variant of ALS. (It is a variant only because it has been slowly progressive – all of his symptoms fall well within this broad-spectrum disorder.) Hawking was diagnosed at age 21 and the disease has slowly paralyzed him – albeit at a rate one-tenth the “normal” progression of the illness. It took 20 years for his disability to mimic the presentation found within 2 years in a typical ALS patient. The movie does an exceptionally stirring job of showing the difficulties family, friends, and spouses endure as they try to maintain normal lives while caring for profoundly ill loved ones. But the movie should not be taken as a serious factual representation of the life of the Hawkings. For example, as Jane is unzipping her boyfriend’s tent, Stephen is far away, having his trachea neatly incised by a surgeon. Although the juxtaposed symbolism is startling and brilliant as it equates young Jane’s affair with the slitting of her husband’s throat, things didn’t happen quite that way. For pursuers of fact, I would point you towards Stephen Hawking: A Brief History of Mine. This more accurate account shows us that Jane is not so young – it is a mature 42-year-old Jane Hawking who made the life-saving decision for her husband’s continued ventilation. The tracheotomy came months later. And, according to Jane’s memoir, she stayed faithful to Stephen – the camping scene is entirely contrived theatre. Dating. The movie shows Hawking’s friends breaking the news about the diagnosis to Jane. In the film, the Hawkings were depicted as a couple – in reality, she heard about his ALS by chance and they were not even dating yet. Croquet. A game of croquet figures large in the movie – it symbolizes Hawking’s frustration with his illness and Jane’s loyalty. The game never happened. Tracheotomy. In the movie, Hawking coughs and chokes at a formal concert and is whisked away in an ambulance – reality was not as dramatic. During a stop in Geneva, his friends were concerned about his persistent cough. They called a doctor. He was admitted to a hospital. The tracheotomy came after Hawking had recovered and had been on a ventilator for months. The family friend. The movie leads the viewer to believe that Jane’s friend, Johnathan Jones, was the family’s sole helper for years. This is not true. A series of Hawking’s grad students lived with the family and helped with his care – one even travelled to California and lived with the family there for a year. The family friend did not. Further, the movie shows Hawking suffering the indignity of his wife’s boyfriend lifting Stephen from the toilet, implying this was how life worked in the Hawking household. It didn’t work that way, but it creates great theatre. Brian. To simplify things, many of Hawking’s colleagues are merged into a single person. This was most artfully executed in “Brian,” portrayed as Hawking’s close friend and confidant, the gentleman who tries to rescue Stephen Hawking from despair. In real life, no such person existed. The voice. In the movie, Jane remarks that Hawking’s new voice is “American” – this drew laughter from the audience, but in reality, she never said it. Instead, Jane thought the voice sounded like a cyborg from the British television series, Doctor Who. I think that Physics actually receives a reasonable treatment from this Hollywood flick, although the New York Times reviewer calls it vastly over-simplified. Of course it is – this is a mass-consumption movie, not a Feynman lecture. At one point, Jane spews one of Hawking’s theories at a dinner table. This theatrical device describes the science in layman’s terms and helps the audience grasp an outline of the scientist’s work. But this movie is not a science movie, and its makers do not portend as much. For the real physics, Errol Morris’s documentary A Brief History of Time will not disappoint you. In the film, I felt that Stephen Hawking’s religious beliefs are intentionally muddled. In what I assume is an attempt to appease a largely religious American audience, Hawking’s well-known and frequently stated atheism is toned down and his wife’s religiosity (which is genuine) was amplified. 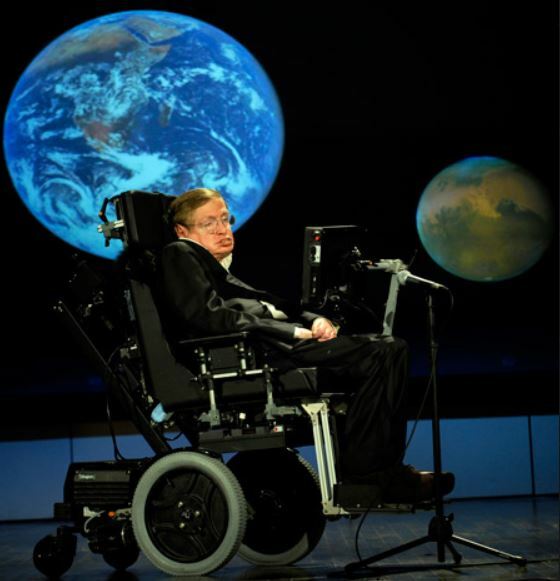 Hawking was shown making allowances for God in the universe and, near the movie’s end, Hawking is asked directly about the role of a deity (and his own beliefs) – the film’s answer is a very indirect and highly qualified retreat from Stephen Hawking’s often stated principles. But perhaps vague innuendo about religion is the best way to satisfy those who may attend this show. To be direct, the producers could have used this quote from Hawking: “There is no god. No one created the universe and no one directs our fate.” You can see Hawking make this statement and its context at this link. It is not presented as a muddled triviality. Although this Mountain Mystery blog is usually about Earth Science topics, I have written at length about this new movie for two reasons. First, I saw the film last night at a first-screening event here in Calgary. My tickets were provided through the distributor, E-One Entertainment and were sent to me by the Canadian Science Writers Association, of which I am a member. So, with gratitude for the E-One advance screening tickets (the movies opens here on Friday) and with thanks to the CSWA, I felt I would blog this bit about the film. But there is a second reason for blogging about The Theory of Everything. And it is personal. Like Stephen Hawking, I have a variant of motor neuron disease. I sensed something was amiss for most of my life. But I was nearly 40 when I finally began to tumble and fall. (The first time resulted in a broken arm; a series of lesser mishaps soon followed.) It took a year of clumsy movement, slow walking, and weakness before I approached a physician. Another year passed before a neurologist reluctantly told me that I probably had ALS. We would monitor the disease monthly and see how it progressed. All of the tests (mostly electrified wires that made me jump like a dead frog) pointed to motor neuron disease, but progression has been incredibly slow. 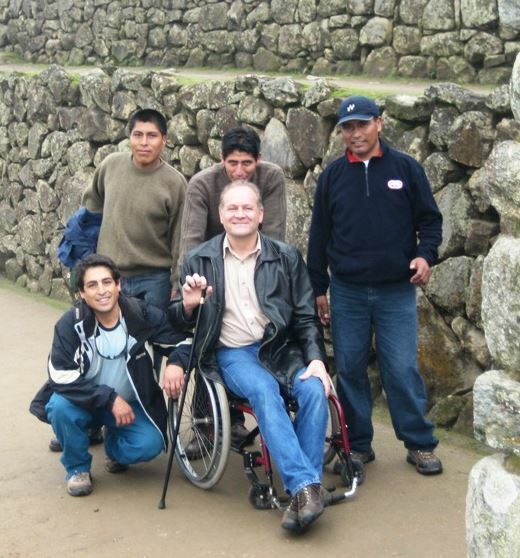 What I have is certainly not typical ALS, nor is Hawking’s disease typical ALS. It is best described as a motor neuron disorder (of which there are many flavours). It took years, but I recently surrendered my outdoor ambulations to a wheelchair, curtailed my travels, reduced my work. Fatigue is chronic. Everything I do takes more energy and frustration than you can imagine. Both of my feet have pronounced foot-drop which requires me to lift my legs high when I try to walk, lest I trip on my toes and plant my face into our wooden floor. My left hand hangs limp and its fingers no longer coordinate their movements very well. My right arm does not rise above my head. But like Stephen Hawking in his younger days, I also have a dedicated wife who spends her free time doing things I should be able to do and who tirelessly works to make my life easier and more comfortable. Unlike Stephen Hawking, I am not profoundly disabled. Nor am I profoundly brilliant. We are all different people, aren’t we? Most of us have some debilitation – often unseen emotional or mental challenges, sometimes unseen medical problems, sometimes severe disabilities that startle others unexpectedly. We all travel the same road, all bound to the same destination. With that in mind, the movie – The Theory of Everything – is less remarkable than it might seem. It is a movie about all of us. It is worth watching, not as a documentary about a scientist and his wife, but as a glimpse into the reality of life and the suffering that every one of us endures. This entry was posted in Biography, Culture, History, People, Religion and tagged ALS, history, Lou Gehrig's, motor neuron disease, Stephen Hawking, Theory of Everything. Bookmark the permalink. This is bit of a spoiler, but makes me want to see the movie – should go this week. Powerful review, thanks. A review definitely worth reading. Thanks for your very personal comments as well.